Hi. I am trying to input values from a user and put them in a linked list. Some how when I display the values that the user inputs, they are both show up under one variable. ie. user inputs $3 and then inputs $5 for next variable. however, when i display, it displays both entered vlues under first variable. attached is code and picture of running program. I don't know what the problem is, but when I display the values that I input from the users, i.e. 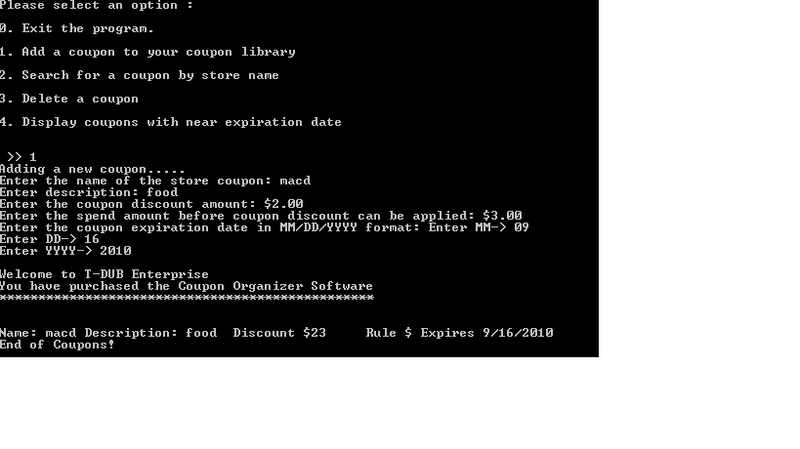 coupon value and minimum to spend rule amount, it just displays both the values as one number under coupon value. i have attached a picture of the screen shot as well as my code. alphabetically based on the name of the coupon's store. Please refer to line 77. Looks like the two numbers are being printed together and appears like a single entity. difference between C++ 4.3.2 and C++ 4.0.0-8 ?